To Cite: Bazrafshan E, Kord Mostafapour F, Faridi H, Farzadkia M, Sargazi S, et al. Removal of 2, 4-Dichlorophenoxyacetic Acid (2, 4-D) From Aqueous Environments Using Single-Walled Carbon Nanotubes, Health Scope. 2013 ; 2(1):39-46. doi: 10.17795/jhealthscope-7710. Background: 2, 4-Dichlorophenoxyacetic acid (2, 4-D) is a widely used herbicide known to be moderately toxic. Extensive use and poor biodegradability of 2, 4-D has resulted in its ubiquitous presence in the environment, and has led to contamination of surface and ground waters. Objectives: At present study, single-walled carbon nanotubes (SWCNTs) were used for the sorption of 2, 4-D from aqueous solutions. 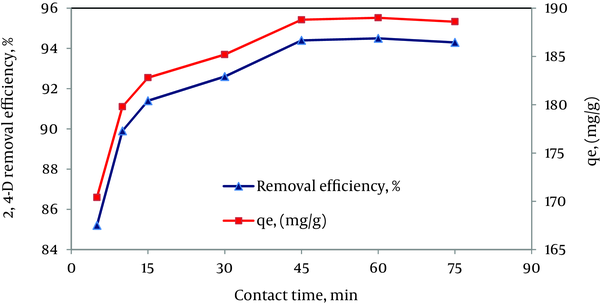 Materials and Methods: The effect of various operating parameters such as initial concentration of 2, 4-D, contact time, adsorbent dosage, and pH were investigated. Equilibrium isotherms were used to identify the possible mechanism of the adsorption process. Results: Maximum adsorption capacity of the SWCNTs was 979.6 mg/g at pH5, contact time 45 min, initial concentration of 5000 µg/L, and 23 ± 2 ◦C temperatures, when 97.96% of 2, 4-D herbicide were removed. The adsorption equilibriums were analyzed by Langmuir and Freundlich isotherm models. It was found that the data fitted to Langmuir (R2 = 0.9987) better than Freundlich (R2 = 0.9727) model. Conclusions: According to achieved results, it was defined that SWCNTs is a quite effective adsorbent in removal of 2, 4-D from aqueous environments. Water is an essential element for life on Earth, which contains minerals extremely important in human nutrition (1). However, the dramatic increase in population resulted in an enormous consumption of the world’s water reserves Nevertheless, the significant increase of population has resulted in a great consumption of the world’s water resources (2). Contamination of surface and groundwater due to synthetic organic chemical compounds is a significant problem, which is attributed to their potential toxic, carcinogenic, and mutagenic effects. The widespread consumption and disposal of pesticides by farmers, institutions, and the general public lead to many possible sources of contamination by pesticides in the environment. Pesticide is a generic term that covers a wide range of biologically-active compounds, including herbicides, fungicides and insecticides. More than 1400 active ingredients are found worldwide in various commercial mixtures of pesticides (3). Also, increasing pesticides application, and improper wastewater disposal methods contaminate water resources, and severely affect the ecology as well as the environment (4). Thus, it is important to prevent the release of these compounds into the environment. 2, 4-Dichlorophenoxyacetic acid (2, 4-D) is a phenoxy herbicide widely used for post emergence control of annual and perennial broad-leaved weeds in cereal cropland, pastures, forests and innoncropland, including areas adjacent to water. It is also used to control broad-leaved aquatic weeds (5). 2, 4-D herbicide is toxic to broad-leafed plants; due to its polar nature once absorbed it is Trans located within the plant, and accumulates at the growing points of roots, and shoots where it inhibits growth. Due to low soil sorption and high potential of leach ability, its residues are often reported in surface and ground water (4). Effects of exposure of professional applicators, homeowners, and bystanders have been studied, but the risk of 2,4-D to human health has not been completely assessed (6). However, the central nervous system is a target organ for the effects of this herbicide in different animal species (7). Extensive use and poor biodegradability of 2,4-D has resulted in its ubiquitous presence in the environment, and has led to contamination of surface and ground waters. Half-live of 2,4-D in water range from one to several weeks under aerobic conditions, and can exceed 120 days under anaerobic conditions (5). It is considered moderately toxic (endocrine disrupter), and the maximum allowable concentration in drinking water is 30 ppb (8-10). 2,4-D herbicides is one of the most commonly used pesticides. Due to its extensive application in agriculture, it was often detected in water environment (11). Therefore, the development of an effective process for the pollutant removal from water or wastewater has been the concern of many researchers (11, 12). Methods for removal of 2,4-D from water and soils include photo catalytic degradation (11-13), advanced oxidation (14, 15), electrochemical oxidation (16), biological treatment (17-19), ion exchange (20), activated carbon adsorption (21, 22), and other adsorbents (23-25). Adsorption is one of the most effective processes of advanced wastewater treatment, which industries employ to reduce hazardous organic and inorganic wastes in effluents. It is also used to remove toxic inorganic and organic compounds from contaminated ground water (26). Also, adsorption process is one of the most promising techniques for pesticide removal due to flexibility in design and operation. Batch and/or column experiments have been undertaken to study adsorption characteristics of some pesticides such as (2,4-dichlorophenoxy) propionic acid (dichlorprop), (4-chloro-2-methylphenoxy) propanoic acid (mecoprop) (27), 2,4-dichlorophenol (DCP), 2- methyl-4-chlorophenol (MCP) (27, 28), atrazine (29), carbofuran (30), and 2,4-D (21, 27, 29-33). Choosing of a suitable adsorbent for pesticide removal is a complex problem because of the wide variety of their chemical structures. 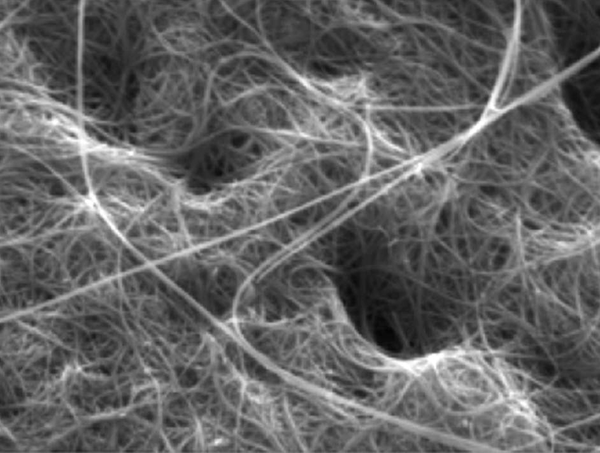 Carbon nanotubes (CNTs) have been the focus of an intensive multidisciplinary due to their excellent mechanical, electrical, and thermal properties since their discovery by Iijima in 1991(34). The relative large specific surface area of CNTs enables them to become candidate for adsorption of gas (35), metal ions (36, 37), and organic compounds (33, 38-40). CNTs include single-walled carbon nanotubes (SWCNTs) and multi walled carbon nanotubes (MWCNTs) depending on the number of layers comprising those (41). For the first time Long and Yang reported that CNTs could be used as superior adsorbents for dioxin, and the removal capacity of CNTs was found to be higher than that of activated carbon (42). Peng et al. and Fagan et al. studied the interaction of 1, 2-dichlorobenzene with CNTs by experimental and theoretical methods, respectively. 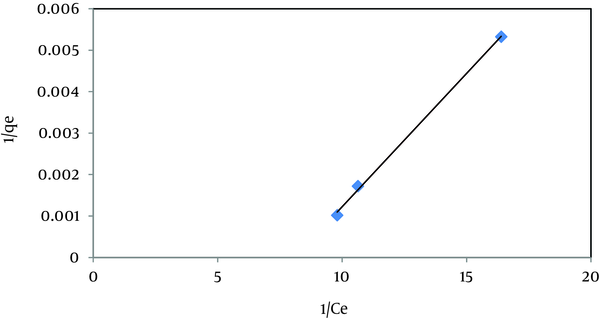 They found that CNTs could be used as adsorbents in a wide pH range of 3–10, and the Raman spectra were in qualitative agreement with calculated results (43, 44). Lin and Xing have investigated the adsorption of phenolic compounds by carbon nanotubes (40). They studied the role of aromatic structure and –OH substitution in the polar aromatics-CNTs system, reporting that sorption affinity of phenolic compounds by CNTs was increased with increasing number of aromatic rings and was greatly enhanced by -OH substitution. In another study, Yang et al. investigated the adsorption of a series of phenols and anilines by MWNTs. They found that nitro, chloride, or methyl groups have enhanced adsorption in the following order: nitro group > chloride group - methyl group (45). The aim of this research was to investigate the adsorption of 2, 4-D on single-walled carbon nanotubes (SWCNTs) under various conditions. Consequently, the influence of several operating parameters such as initial concentration of 2, 4-D, contact time, adsorbent dosage, and initial pH were investigated. Furthermore, equilibrium isotherms were used to identify the possible mechanism of the adsorption process. 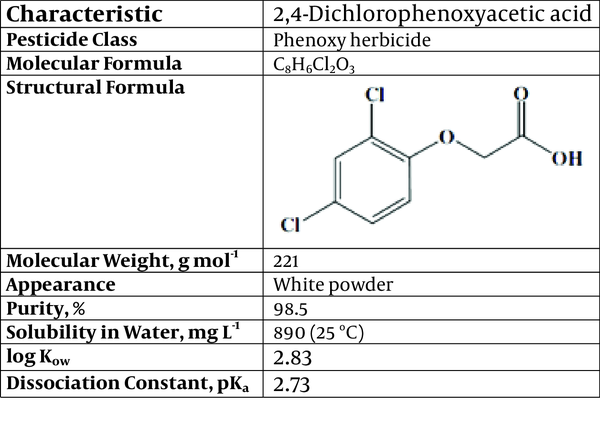 2, 4-D herbicide was purchased from the Merck Company (Germany); some of the important physicochemical properties of 2, 4-D are given in Table 1. All other chemicals and reagents used were analytical grade, and distilled water was used in the preparation of solutions in the present investigation. Stock solution of 2, 4-D (100 mg/L) was prepared by dissolving 2,4-D in 500 ml distilled water. It was then wrapped with aluminum foil to prevent any unwanted side-reactions induced by light (33). For treatment experiments, the required solutions with concentrations in the range of 1000–5000 µg/L were prepared by successive dilution of the stock solution with distilled water. Single-walled CNTs (provided from Research Institute of Petroleum Industry (RIPI), Tehran, Iran) was selected as adsorbent to study the adsorption characteristics of 2,4-D from aqueous solutions. On the basis of the information provided by the manufacturer, the SWCNTs were synthesized by catalytic chemical vapor deposition (CVD) method. The morphologies of SWCNTs were examined by using SEM (JEOL JSM-6700F) (Figure 1). The size of the outer diameter for the SWCNTs was 1-2 nm. The length of SWCNTs was 10 μm. Furthermore, specific surface area of SWCNTs was more than 700 m2/g, and the mass ratio of the amorphous carbon of SWCNTs was less than 5%. Because carbon nanotubes had the amorphous carbon, and therefore the adsorption rate is very low, therefore, carbon nanotube should be purified. To functionalize SWCNTs, 0.3 g of the as-received SWCNTs was dispersed in 25 mL of nitric acid (65 wt. %) in a 100 mL round bottom flask equipped with a condenser, and the dispersion was refluxed under magnetic stirring for 48 h. After that, the resulting dispersion was diluted in water and filtered. The resulting solid was washed up to neutral pH, and the sample was dried in vacuum at 40 °C overnight. Optimization of pH for adsorption medium plays a vital role in the adsorption studies. The pH of the adsorption medium is the most significant parameter in the treatment of pollutants by the adsorbent (42). Also, the solution pH is one of the key parameters that controls the adsorption process on carbon materials; it controls the electrostatic interactions between the adsorbent and the adsorbate (43) Furthermore, the initial pH of solution is an important parameter that can control the adsorption process of pollutants on carbon materials; in fact it controls the electrostatic interactions of the adsorbate and adsorbent in aqueous environments (49). 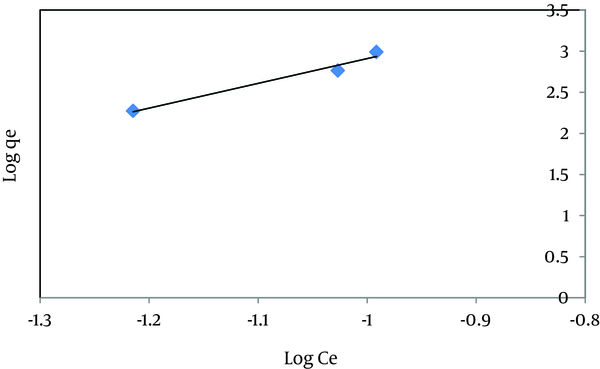 Figure 2 shows the effects of initial pH values within the range of 3–13 on the efficiency of 2,4-D adsorption by SWCNTs with the initial dosage of 2.5 mg/L, and the initial 2,4-D concentration of 1000 µg/L, for the contact time of 60 min. It is clear that the adsorption of 2,4-D herbicide onto SWCNTs fluctuates very little in the pH range of 3-13. Nevertheless, it can be seen that the sorption amount for 2, 4-D increases with increasing the solution pH up to 5 (91.3%), remained almost constant until pH 7. This may be due to the fact that the employed SWCNTs have been purified by acid solution to improve their properties which may enhance the resistance of CNTs to acid environment (44). However, the adsorption of 2,4-D decreased as the pH exceeded 7. This is due to the fact that more oxygen-containing groups on the CNTs surface are ionized at higher pH values, and thus they adsorb more water (45). The formation of water cluster on these groups blocks the access of 2,4-D herbicide molecules to adsorption sites, and results in less adsorption of 2,4-D. However it must be considered that 2,4-D herbicide can be hydrolyzed at neutral and alkaline pH. The rate of hydrolysis is pH dependent, with the hydrolysis half-life at pH 9 much shorter than the half-life at pH 6 (46). Similar findings were reported by Naghizadeh et al. and Legrouri et al. (47, 48). 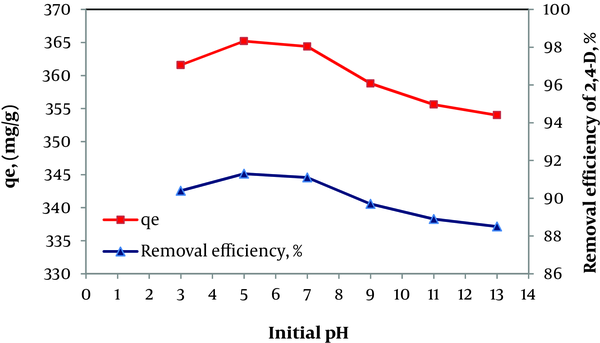 Thus, the pH was maintained at 5 in all the subsequent experiments, which was considered the best relation between the total adsorbed amount of 2,4-D, and percentage of removal. The adsorbent concentration is an important parameter because this determines the capacity of the adsorbent (SWCNTs) for a given initial 2, 4-D concentration. To attain the optimal amount of SWCNTs for the adsorption of 2, 4-D, 2.5, 5 and 10 mg/L adsorbent (SWCNTs) were used for adsorption experiments at fixed initial pH (pH 5), initial 2, 4-D concentration (1000 µg/L), and temperature (23 ± 2◦C) for contact time of 60 min. As can be seen in Figure 3, 2, 4-D herbicide removal is dependent on the mass of adsorbent present in the solution, and it increases when the adsorbent dosage increases. On the other hand, the percentage of 2, 4-D removal steeply increases with the adsorbent loading up to 10 mg/L. This result can be explained by the fact that the sorption sites remain unsaturated during the sorption, whereas the number of sites available for sorption site increases by increasing the adsorbent dose. The maximum adsorption efficiency of 2, 4-D herbicide onto SWCNTs was found to be 94.7% at adsorbent concentration of 10 mg/L. 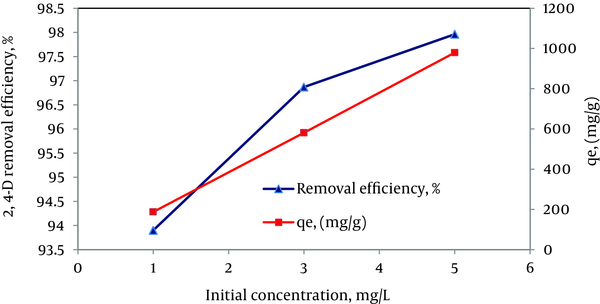 Furthermore, when the adsorbent dosage increased, percentage removal of 2,4-D also increased, but amount of adsorbed 2,4-D of per gram adsorbent (qe) decreased due to the fact that fixed 2,4-D herbicide concentration (1000 µg/L) led to unsaturated active site on adsorbent surface, and increase in the adsorbent concentrations caused particle aggregation (49). 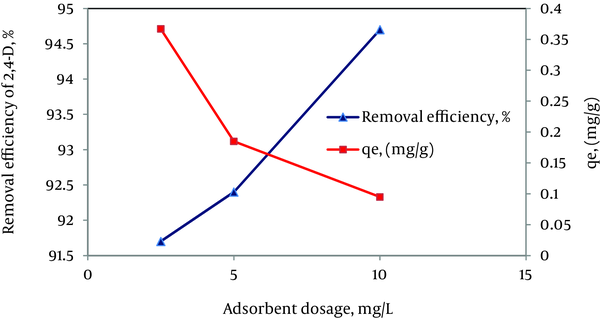 Thus, the adsorbent dose was maintained at 5 mg/L in all the subsequent experiments, which was considered the best relation between the total adsorbed amount of 2,4-D, and percentage of removal. Contact time is one of the most important parameters for practical application. The effect of contact time on adsorption was studied at 23 ± 2 ◦C, initial 2, 4-D concentration (1000 µg/L), and 5 mg/L adsorbent dosage for 5 to 75 min. According to Figure 4, 2,4-D adsorption rate increased quickly with time, and then reached equilibrium. The contact time to reach equilibrium was 45 min. The adsorption capacity and percent removal of 2, 4-D onto the SWCNTs significantly increased during the initial adsorption stage, and then equilibrium was nearly reached after 45 min. At this time, removal efficiency reached to 94.4%, and adsorption capacity of the SWCNTs was 188.8 mg/g. Hence, in the present work, 45 min was chosen as the equilibrium time. Generally the removal rate of sorbate is rapid initially, but it gradually decreases with time until it reaches equilibrium. This phenomenon is attributed to the fact that a large number of vacant surface sites are available for adsorption at the initial stage, and after a lapse of time, the remaining vacant surface sites are not easy to be occupied due to repulsive forces between the solute molecules on the solid and bulk phases. On the other hand, the rate in percent of 2, 4-D herbicide removal is higher in the beginning due to the larger surface area of the adsorbent being available for the adsorption of the pollutants. As the surface adsorption sites become exhausted, the rate of uptake is controlled by the rate of transport from the exterior to the interior sites of the adsorbent particles (50). Similar findings were reported by Cengiz and Cavas (51), Naghizadeh et al. (48), and SenthilKumar et al. (52). The initial concentration of pollutant affects both the adsorption capacity of the adsorbent, and the adsorption rate. Also, the initial concentration provides an important driving force to overcome all mass transfer resistance of the adsorbate between the aqueous and solid phases (53). At present study, the effects of initial 2, 4-D concentration on adsorption were studied at 23 ± 2◦C and 5 mg/L adsorbent concentration for 45 min. Figure 5 shows that removal efficiencies of herbicide increased with increasing concentrations. As can be seen in Figure 5, when the initial 2, 4-D herbicide concentration is increased, the amounts of adsorbed 2, 4-D also increase, so the removal of 2, 4-D depends on the concentration of 2, 4-D. For example, when the initial 2, 4-D concentration increases from 1 to 5 mg/L, the equilibrium sorption capacities of SWCNTs increase from 187.8 mg g-1 (93.9%) to 979.6 mg/g (97.96%). Similar trends have also been observed for methylene blue dye sorption onto bamboo-based activated carbon (54), and cotton waste (55). This increase in the proportion of removed herbicide may be probably due to equilibrium shift during sorption process. A similar result has also been recorded for adsorption of Trichloroethylene from aqueous solution onto MWCNTs (48). The initial 2, 4-D herbicide concentrations provide an important driving force to overcome the mass transfer resistance of the 2, 4-D between the aqueous phases and the solid phases, so increasing initial concentrations would enhance the adsorption capacity of 2, 4-D.
Isotherms study can describe how an adsorbate interacts with adsorbent. The isotherm provides an association between the concentration of 2, 4-D in solution, and the amount of adsorbed on the solid phase when both phases are in equilibrium. At present study equilibrium adsorption data were analyzed using the Langmuir, and Freundlich isotherm models (Figures 6 and 7). Also, analysis of isotherms was used to describe the experimental adsorption data, and then best results can be obtained when correlation coefficients (R2) come close to 1. High values of R2 (close or equal to 1) indicate the conformity among experimental data with model isotherm (59). The Freundlich equation is used to describe isotherm data for heterogeneous adsorbents (varying site energies) much better than the Langmuir or BET equations (60). The isotherms based on the experimental data, and the parameters obtained from nonlinear regression by both models are shown in Figures 6 and 7. Also, all of the parameters are listed in Table 2.The R2 values of Langmuir, and Freundlich models (Table 2) are 0.9987, and 0.9727, respectively, indicating that the Langmuir model is suitable for describing the adsorption equilibrium of 2, 4-D onto SWCNTs. 2,4-D herbicide is toxic to broad-leafed plants, animals and human, and extensive use, and poor biodegradability of 2,4-D have resulted in its ubiquitous presence in the environment, and have led to contamination of surface and ground waters. At present study the adsorption of 2, 4-dichlorophenoxyacetic acid (2,4-D) on SWNTCs was studied as a function of solution concentration, pH, adsorbent dose, and contact time. From the current study, it can be seen that the SWNTCs can be used effectively for the removal of 2, 4-D herbicide from aqueous solutions. The percentage eliminated was found to depend on the amount of adsorbent, the initial concentration of 2, 4-D, and the 2, 4-D-adsorbent contact time. The SWNTCs was able to remove 94% to 98% of 2, 4-D from solutions, which initial concentration varied between 1000 and 5000 µg/L. Nevertheless, minimum concentration of 2, 4-D equal 61 µg/L was attained at the optimum condition of process (pH = 5, adsorbent dosage = 5 mg/L, contact time=45 min and initial 2,4-D concentration = 1000 µg/L), which is higher than the maximum allowable concentration in drinking water (30 µg/L). This study was funded by the health research deputy of Zahedan University of Medical Sciences (Project Number: 90-2398), and was conducted in the Chemical Laboratory of School of Public Health, Zahedan University of Medical Sciences. Implication for health policy/practice/research/medical education: The content of this article is useful for water and wastewater treatment plant managers and operators and drinking water providers to better operation and supervision of water and waste water treatment plants and water resources. Please cite this paper as: Bazrafshan E, Kord Mostafapour F, Faridi H, Farzadkia M, Sargazi S, Sohrabi A. Removal of 2,4-Dichlorophenoxyacetic Acid (2,4-D) From Aqueous Environments Using Single-Walled Carbon Nanotubes. Health Scope. 2013; 2(1): 39-46. Authors’ Contribution Conceived and designed the experiments: E. Bazrafshan, and M. Farzadkia; performed the experiments: E. Bazrafshan,and H. Faridi;Analyzed the data: H. Faridi,and Sh. Sargazi; Contributed reagents/materials/analysis tools: F. Kord Mostafapour, and A. Sohrabi;Wrote the paper: E. Bazrafshan.